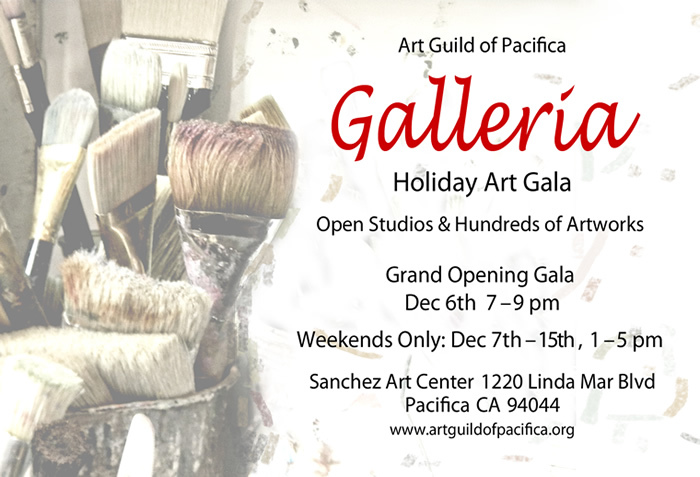 Art Guild of Pacifica presents its 2nd Annual Galleria, a multi-faceted exhibition presented to the public just in time for the holidays. It opens on Friday, December 6, with a lively reception from 7 to 9 pm. at Sanchez Art Center, 1220 Linda Mar Boulevard. First, there is a salon-style exhibition in the West and Main Galleries. The art of AGP Members is displayed in a riot of shape, color, and form, and is offered at extremely reasonable prices. Buyers are free to take their purchase home with them at the time of sale. Participating artists receive 100 percent of the price of their work. Located at the opening of the West Wing, the Gallery Store offers a large number of gift items created by AGP members, including cards, jewelry, and holiday ornaments. Galleria opens Friday evening, December 6, 7–9 pm, and continues on two consecutive Saturdays and Sundays, December 7–8 and December 14–15, from 1 to 5 pm, as well as during most weekend Pacifica Performances intermissions. The public is invited to visit this unique exhibition and sale, Art Guild of Pacifica’s final presentation of the year, for free at Sanchez Art Center, 1220 Linda Mar Boulevard, in Pacifica. Parking is also free and readily available. 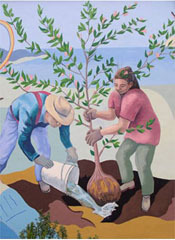 For more on Art Guild of Pacifica general information or membership, visit www.artguildofpacifica.org or send an email to artguild@gmail.com.